Next is my sassy twist on candied bacon. It is salty, sweet and muy caliente! This candied bacon is totally legit! It is also multi-function! As easy as it is to eat this on it’s own, it can also be used as a topping for other sweet treats. 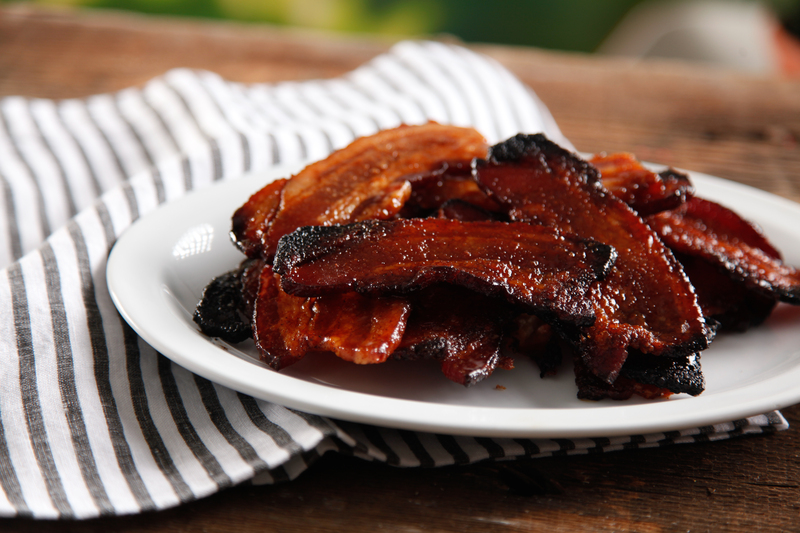 Crumbled atop cookies or cupcakes or as a jazzed up ingredient for a decadent salad… use your imagination and make bacon! *Mix brown sugar and chili powder together. make sure you have even distribution of your chili. *Coat bacon with sugar mixture by laying bacon on top and pressing firmly. Flip bacon and repeat. *Place a baking rack over a cookie sheet and lay your coated bacon strips out evenly. *Allow to cool and serve upright in several shallow cups or ramekins.